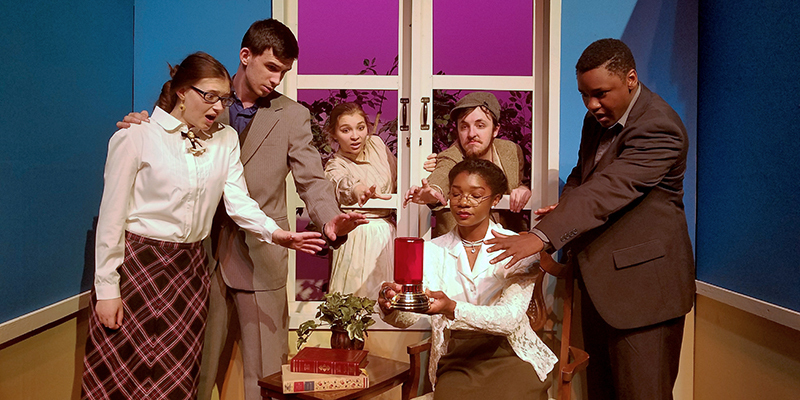 “The Red Lamp” cast members include Amanda Berube as Alice Deering (far left); Cody Marlock as Archie Clarke (left); Torrie Molmer as Annie O’Shane (left window); Hack Gallota as Bill Worth (right window); Jasmine Hopkins as Matilda Deering (seated); and Robert Smart as Harold Deering (far right). If you love a zany story told on stage, then Tidewater Community College’s “An Evening of Lit Art” is for you! The presentation is a collaboration of the college’s Creative Writing Club, Literary Festival and Theatre Arts department. Students will present their original poems, stories and other writings and perform in Hilliard Booth’s one-act play, “The Red Lamp.” TCC Professor Matthew Gorris will direct the production. Performances will be held April 4-7 at 7:30 p.m., in the Black Box Theatre in the Academic Building on the Chesapeake Campus, 1428 Cedar Road. “The Red Lamp” revolves around a hungry tramp who breaks into a house and recognizes a lamp that supposedly brings good luck when lit. A son befriends the tramp, who leaves when the boy’s aunt returns. The boy agrees to light the lamp after his aunt leaves the house as a signal for the tramp to return. A daughter also agrees to use the same signal to let her lover know her aunt, who disapproves of the match, has left the house. The aunt also lights the lamp to signal a neighbor to prepare tea. Ensuing complications are fast, furious and unexpected. Tickets are $10 for adults and $5 for students, seniors and military-related patrons. Payment is by cash or checks at the door. The box office opens 45 minutes prior to show time. Tickets can also be purchased with a credit card at the business office in the Pass Building on the Chesapeake Campus Monday and Tuesday between 8:30 a.m. – 6:30 p.m. and Wednesday through Friday 8:30 a.m. – 5 p.m.
For more information, call 757-822-5219 or email mgorris@tcc.edu. Also, mark your calendars for TCC’s Shakespeare in the Grove’s presentation of “Othello,” on June 20-24 at 8 p.m., weather permitting.